While Thanet Kyokushin-Jutsu Kai (KJK) headed by Shihan Mick Maume is not part of Elite Fighting Arts - Kyokushin Academy, the club shares a common goal and uses the same facilities. Mr Maume started his career in Karate from the garage at the back of a cafe on Sturry road in Canterbury in 1970. His training was originally with a retired professional wrestler by the name of Frank Price and only lasted for about 1 year. Mr Maume then took a number of years out to have a family and then was temped back in 1983 by an advert in a local chip shop. Mr Maume then took his children to the club in Wincheap, Canterbury which was run by a second dan called Malcolm Stauton who was a student of Kyokushin legend, Sensei (now Hanshi) Bernard Creton. Mr Maume use to train 3 or 4 times a week plus some weekends in Canterbury, Ashford, Folkstone, Maidstone, Hastings plus other locations in the south east. 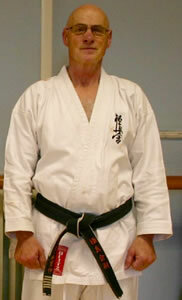 In 1987 Shihan (Master) Creton asked him to start a club up in Margate and he has been in the area ever since. More classes available. Please refer to Instructors page. £20 per month - 3-16yrs.